You can enjoy the plants, rocks and historical items because others left them for you. Leave what you find so that the next person can enjoy them. Please observe the courtesies of the trail, the campground, and roads. 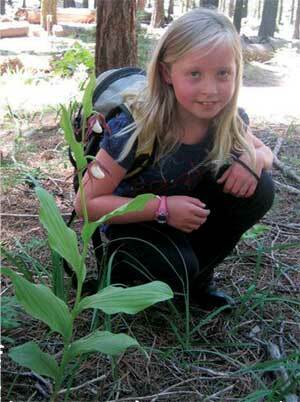 Use existing camp areas and walk on the main trails to protect nature. Pick up your trash and take it with you. Remember this is a Pack It In – Pack It Out area. Follow the Leave No Trace Outdoor Ethics. Respect wildlife. Watch wildlife from a distance and never approach, feed, or follow them. Protect wildlife and your food by storing your meals and trash tightly. Be kind to other visitors. Make sure the fun you have in the outdoors does not bother anyone else. Remember that other visitors are there to enjoy nature. Listen to Nature. 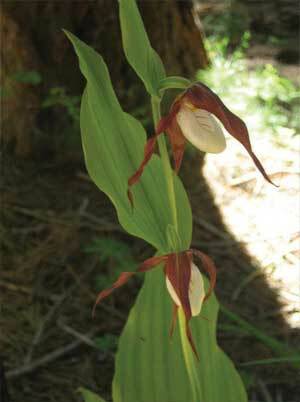 The rare orchid shown below reaches it southern distribution limit in the Sierra Nevada at Nelder Grove. It is a Forest Service Sensitive species, and picking or disturbing these plants is prohibited. Please take only photographs.